Brad Scott's Kangaroos are finally off the mark in 2019, running down Adelaide at Marvel Stadium to record a welcome 9.17 (71) to 8.11 (59) victory. The much-hyped Crows, on the other hand, slump to 1-3 and their season of redemption is in serious danger of falling short. For much of the night it seemed as if North's brutal inefficiency, especially in comparison to the other end, would undo the good work it was doing. Enter Ben Brown (four goals), the mop-haired spearhead whose own form was a source of discussion throughout the week, with club legend Wayne Carey among the harshest critics. 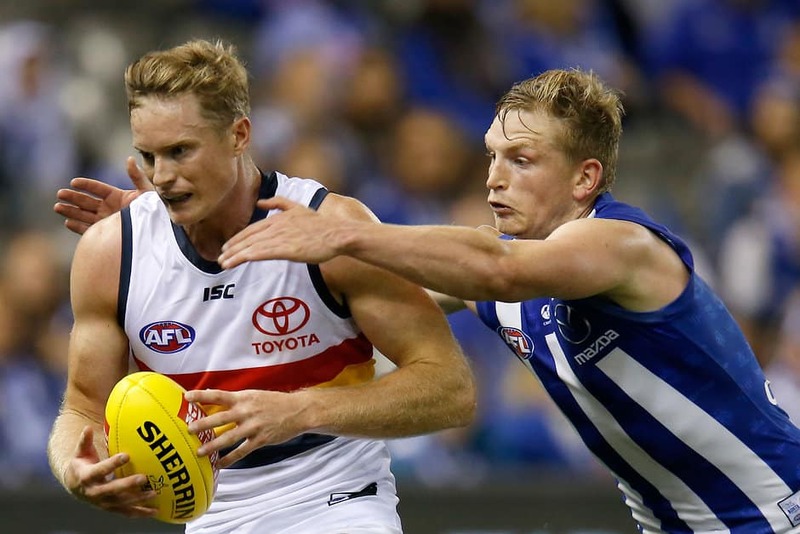 His third-quarter heroics changed the match's direction for good, although the result was still up for grabs inside the final two minutes as the Roos continued to win the midfield battle. Brown was fortunate to score two of his three goals in the term from free kicks – one in a ruck contest against Reilly O'Brien and another opposed to Daniel Talia – but he created headaches. He won seven disposals (three contested) and took a couple of marks in the same period to rattle the usually unflappable Talia. Adelaide led by 20 points when Wayne Milera goaled on the run almost eight minutes into the third term, but the Roos responded with the next six majors to charge over the top. They went to three-quarter time with a five-point edge, but the final two goals of that North streak – to Ben Cunnington then Zurhaar – gave Scott's men a more comfortable buffer. Eddie Betts bagged three goals in his 299th game, including a mid-air strike in the goal square. Betts’ third goal was an audacious checkside effort from so deep in the pocket he had to ditch the Gatorade seat. Ironically, the Kangaroos' only goal from their first 10 scoring shots came courtesy of a brilliant Higgins set shot from just inside 50 and barely inside the boundary. Eight consecutive behinds of varying difficulty followed the Higgins kick as they threatened to shoot themselves in the foot. Making matters worse, 100-gamer Luke McDonald gave away a crude free kick for late and high contact that gifted top-10 draftee Chayce Jones a shot at goal. Jones was later assessed for a concussion and ruled out for the night soon after. Usual suspects Rory Laird (31 disposals) and Matt Crouch (29) were prominent for the Crows. North Melbourne enters its annual Good Friday contest off the back of a belated victory and looking to maintain the momentum against a suddenly in-form Essendon. The Crows will face Gold Coast at Adelaide Oval on Easter Sunday.